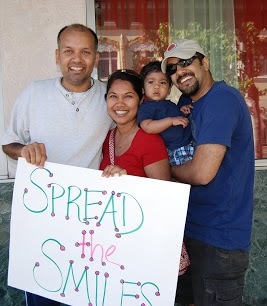 Inspired by a series of smile events in Fremont and San Francisco, a few kindred friends came together in Berkeley on Mother’s Day to pay our gifts forward. Gathered at Leah’s just-moved-in apartment, we kicked off the afternoon by crafting notes to leave on car windshields and give to passer-by on foot. Once everyone arrived, we grounded ourselves in a couple minutes of silence, shared introductions in an opening circle, and put the finishing touches on our smile posters, and hit the streets! 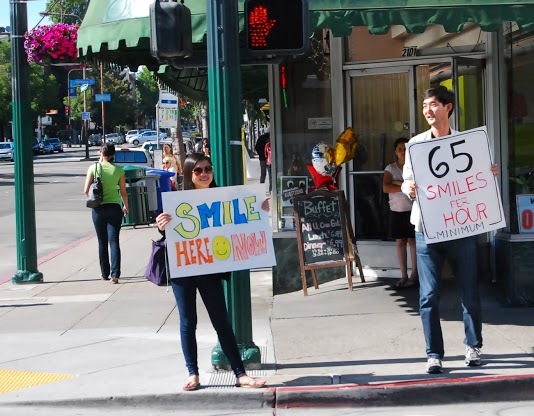 It’s true what B2 shares about smiling—it really is a bridge for breaking down barriers. There’s something about the benevolence of a smile, and the collective group energy, that made strangers dissolve into friends. From the moment we step out of Leah’s door, we begin making friends. The family eating lunch outside strikes up instant, inquisitive conversation. Jo is approached by several people, and delves into lengthy conversations with each of them. An older man in a weathered suit and hat asks Guri what we are doing. As she explains it to him, he smiles. In the first few minutes upon arriving at Shattuck and University, a young woman named Michelle crosses the street. Something keeps her from walking away. After watching for a bit, she introduces herself, takes an extra sign from Fumi, and joins in the cheering. 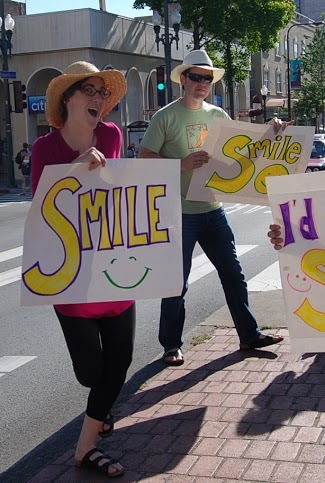 Later on, Sarah stands on the same street corner beaming one of the widest, longest lasting grins I’ve ever seen. We wave, offer her an extra sign, and she eases into the mix as though it is second nature. Positioned between two traffic lights, cars flood past us in waves. AC Transit bus drivers honk in support as they turn the corner. Some roll down their windows. Others drive by without a second glance. One car circles around again. And again. And again. Cheering all the way. Honking takes on new meaning. At this particular corner, they’re usually prompted by frustration at being stopped by two traffic lights back-to-back. But this afternoon, they were celebratory. Some honked in response to our signs. Some just echoed the other cars honking. Whatever it was, the spirit was infectious. 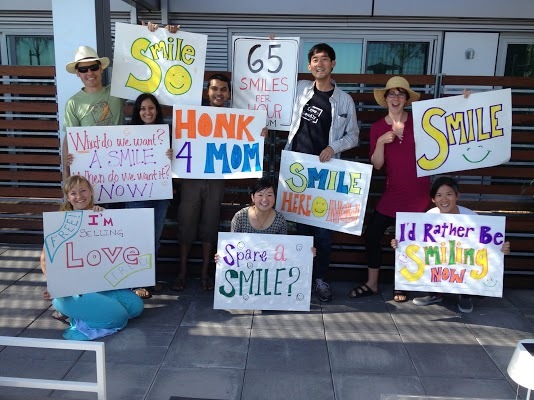 Each honk was like an ode to life—a celebration for moms, for smiles, for each other. In the midst of hundreds of passing cars honking and cheering us on, one interaction stands out for me. As we were about to wrap up, a middle age lady stops at a red light turns her head to read one of Leah's signs. "I'm Selling Love! It's Free". I'm not sure what prompted her, but she instantly rolled down her window and with a laugh exclaimed, "We are in the same business!" After all we weren't in business, we were in giveness. :-) Give smiles, and spread love. 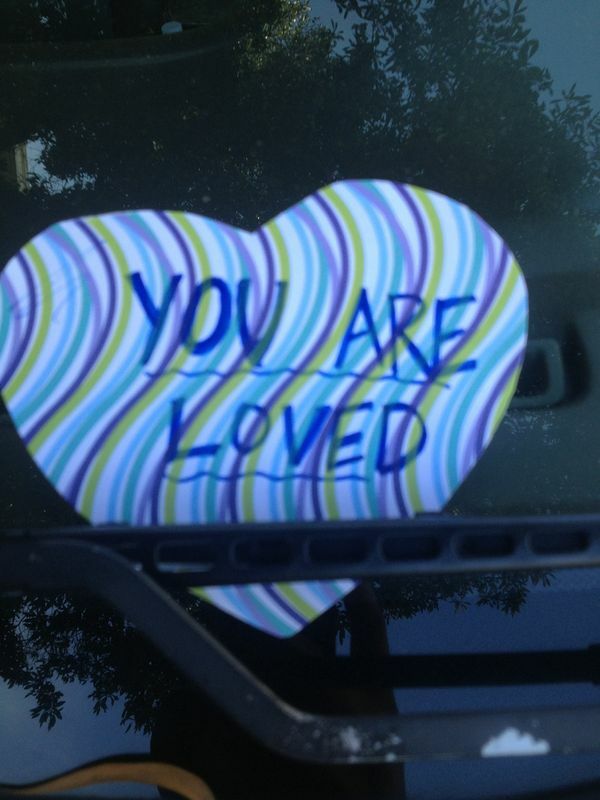 And in the spirit of spreading love, she reached out with a memorable Mother's Day car-hug!